Chile's President: Why Did Tsunami Warnings Fail? As rescue efforts continued in the devastated area around Chile's second largest city, Concepción, Chile's President said the government would investigate whether a crucial tsunami-warning system failed to alert residents to the fact that they were in the path of an incoming giant wave. In an interview with TIME at Chile's Squadron 10 air force base outside Santiago, where hundreds of troops waited to be shipped to Concepción to combat looting and social unrest, President Michelle Bachelet described how in the hours after the quake, a breakdown in communication in the region may have prevented warnings of a tsunami from reaching vulnerable populations. She said her office was not even aware of the danger of a tsunami until after it had washed ashore in many places. "All the communication was lost," she told TIME. "The first information about a tsunami that I received was people calling from [the Chilean islands of] Juan Fernández saying they had been hit." Further hindering an early warning for residents was a seismic-information system used by Chile's navy that initially provided inaccurate data on the location of the earthquake. 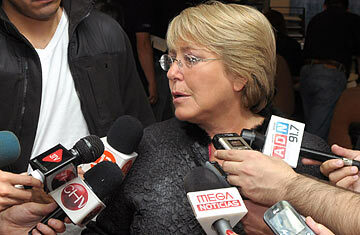 Bachelet pledged an evaluation of the system. "There will be a moment in the future when we must evaluate [how our warning system functioned] in detail," she said. "We have a navy [measurement] system that has 19 installations along the coast. The information in the beginning was not exactly from the central point where the epicenter hit. It was thought in the beginning that the epicenter was down in the earth, not in the sea." A large wave crashed into the Juan Fernández islands in the Pacific Ocean, killing at least eight people and leaving another eight missing, the Chilean emergency office said. Local reports suggested that many fishing villages on the mainland had also been hit by the wave. A warning could have allowed villagers on the coast to flee to higher ground. "The truth, even if it hurts, [is that] a division of the navy made a mistake," Defense Minister Francisco Vidal told reporters. He blamed the navy for not issuing a tsunami warning after the Feb. 27 earthquake rocked the South American country. Initially, the death toll from the 8.8-magnitude quake was believed to have been caused by falling structures. But Bachelet said that information arriving from the coastal region suggested that the tsunami, which she said arrived 30 to 45 minutes after the quake in most places, was also responsible for the damage. "It was both," she told TIME. "In Juan Fernández, there was no earthquake, just a tsunami. We don't have exact [figures], but we know that people are dead because of the tsunami." Meanwhile, eyewitness accounts emerged suggesting that in some cases, authorities not only failed to warn shoreline residents of a tsunami, but also may have inadvertently put them in harm's way. "After the earthquake, many people wanted to flee, but firefighters and police in many villages and areas told people to stay in their homes," said an army soldier who had recently returned from the Concepción area and who spoke to TIME on condition of anonymity. "Many residents obeyed, and then they were overrun by the tsunami. It was a cruel situation." Bachelet, however, offered a different account, telling TIME that local firefighters had warned residents to evacuate after a strong quake in a simulation exercise two weeks before last weekend's tremor hit. "When I was in Constitución [a town north of Concepción on the coast], they told me that two weeks earlier, the local firefighters ran an earthquake rehearsal," she said. "They taught the population that if they could not stand up while it was trembling, it meant they had to go up into the hills because there was the possibility of a tsunami. So in that town this situation happened and they went up into the hills, and many lives were saved." The total number of troops in the Concepción area will soon reach 7,000. Testimony from evacuees returning to Santiago at the Squadron 10 base suggested that looting had become a serious problem in the region. A team of U.S. officials were dispatched from the embassy to search for American citizens. Taviera Espinoza, 28, who was on vacation in Concepción and had managed to evacuate on a Hercules transport plane, told TIME that she and her family fled their rental home after the earthquake because they feared a tsunami. They came back to find the aftermath of looting. "When we returned, the house was empty," she said. "They stole everything: TV, food. Everything." Angelo Briones, who serves in the Chilean navy, was so distressed by the descriptions of looting in e-mails from his Concepción-based family that he decided leave his post to "go protect my family." While waiting for a space on a transport plane in Santiago, he told TIME, "I told my boss that there was nothing he could say. My family is my blood. I have to go be with them. Thank God he gave me permission. It is a disaster zone there. I am very scared."